There are many types of urban agriculture. This article does not go into educational farms or training programs, community gardens, or backyard “self-provisioning” gardens. Operations that are not land-based, such as rooftop, controlled environment, and hydroponic businesses have different considerations, not covered here. Commercial farms are operated as businesses, typically by private entities. A commercial farming enterprise could be under the umbrella of a nonprofit organization that also engages in educational or other charitable programs. In fact, nonprofit urban farms appear to be more common than private commercial operations. Urban agriculture of all kinds offers many social, health, environmental, and economic benefits—all of which have been widely discussed. Among the most substantial benefits are the positive impacts on community well-being, and expanding awareness of and engagement with food production and healthy food. For commercial producers, urban settings can offer highly accessible and diverse markets, rewarding interactions with customers and neighbors, options for ancillary services such as educational programming, and an opportunity for urban dwellers to realize their farming goals. Commercial urban farms can range from small backyard plots to 10 acres or more. Farming in urban settings presents some challenges distinct from rural farming. It requires sensitivity to the historical and current racial, socioeconomic, geographical, and cultural dynamics, often in complex, highly diverse areas. Other challenges are similar to those in non-urban settings, but with a different wrinkle. These can include soil quality concerns such as toxic contamination and rubble, theft and vandalism, and lack or cost of infrastructure such as water, fencing, and buildings. Urban farmers might also be concerned about air quality, equipment storage, and parking, depending on their location. Establishing a viable commercial urban farm requires creativity, determination, and diplomacy. Land access is a common barrier for beginning and other farmers, and is uniquely challenging within urban settings. Availability, cost, parcel size limitations, specific location (e.g., proximity to markets or residence, neighborhood acceptance), and competing uses make secure tenure on appropriate urban parcels difficult. In general, most urban land is not affordable to purchase for most farm operations. And what’s affordable may not be suitable for farming. As with their rural counterparts, many urban farmers seek alternatives to buying land, such as leasing. What are these land access and tenure challenges in urban settings? How can you as a commercial farmer get onto and hold land? What innovations mitigate these challenges and promote access to land for urban farming? Land availability varies greatly by city, depending in part on its history, current conditions, and density of development. Who owns the land will impact its availability to farmers and any resulting use agreement. Often, vacant lots are seen as attractive for urban agriculture. But what is a “vacant” or empty lot? Technically, a vacant lot is a parcel of land that has no buildings on it. Often, it is a neglected or abandoned parcel that may have had a building on it at one time. Lots that have been repurposed for community gardens or play space may still be considered “vacant” if these open space uses are not recognized. In many neighborhoods, informal uses are important to residents, and pocket open spaces might not be available for production. In addition to vacant lots, suitable open spaces for production could be found as part of a larger parcel containing buildings, recreation areas, and/or other activities. Critical to the farmer’s tenure is who owns the parcel. Land ownership can be divided into two main categories: private and public. Public land-holding entities can include municipal redevelopment authorities, housing authorities, parks departments, school departments, public utilities and transportation agencies, as well as state and federal agencies. Publicly owned land can also include historic sites, and land held by land banks. Privately owned urban land may be held by individuals, investors, for-profit corporations, churches and other religious organizations, banks, private institutions such as some schools, colleges, and hospitals, and other charitable or educational nonprofits. There are also private utility and transportation companies that own urban land. Finding available parcels and identifying their ownership may require a bit of effort. Some cities have land inventories that can be accessed online. For example, New York City maintains an inventory of city-owned land that is updated every two years. It identifies, among other variables, whether it is suitable for urban agriculture (of all kinds). Cleveland, Ohio has a Vacant Land Inventory for Urban Agriculture. Although they tend to be more community oriented than farm business oriented, support organizations in many cities, part of the Land Access Advocacy Network, have online tools for identifying vacant land, such as Lots to Love in Pittsburgh, Pennsylvania, Grounded in Philly in Philadelphia, Pennsylvania, and 596 Acres’ Living Lots NYC. Farmers can call the city’s planning or zoning department to determine ownership, as well as to see if there are any easements or other liens on a parcel. Tax or property records will give you the owner’s name and possibly phone number and address. Most such records are online, but you may have to visit the appropriate office. Some private owners of vacant parcels may be absentee, and tracking them down may present a challenge. Consider asking neighbors for information. Some cities have a land bank—a public or private entity that holds and disburses parcels, typically for future development. These are often vacant, abandoned, tax delinquent, or foreclosed properties. Many land banks are interested in selling properties they hold, sometimes at bargain rates. And while most land banks’ primary purpose is not related to agricultural uses, it may be possible to access property through a land bank for agriculture, possibly even with a dwelling and enough land for small-scale production. For example, a couple in Lansing, Michigan rents a residential parcel from the Ingham County Land Bank. They raise crops and bees on this land. They’ve expressed interest in purchasing the property, but the land bank does not currently have a process for such a transfer. In addition to land bank disposition, cities often sell tax delinquent property through a sheriff sale or auction. Some cities have side-yard programs to make it easier for residents to acquire vacant lots adjacent to their homes. Locating a suitable parcel requires more than a drive-by and finding the owner. Zoning and other city ordinances will determine what is possible onsite. Not all municipalities or neighborhoods are receptive to agriculture. Read below for more information about regulations. Urban commercial farmers face many of the same land tenure issues as producers in rural and suburban areas. Can you afford to purchase the land you want to farm? If not, can you obtain an adequately secure and affordable rental agreement? Municipal ordinances may determine the kind of tenure available and under what terms. As with rural farming, insecure tenure limits a farmer’s ability to make physical improvements, and puts farms at risk of losing not just access to the land itself, but also investments made in building relationships with neighbors, customers, and suppliers, improving soils, and installing infrastructure. The two main categories of tenure are ownership and tenancy. Ownership: Most public land-owning entities can sell land they hold, but the process can be cumbersome and regulations control what a specific entity is allowed to do regarding disposition of real estate. In most states, disposing of state-owned land involves a state agency declaring a property in its jurisdiction “surplus.” This triggers a sequence of actions, starting with making the surplus property available to other state agencies, then county and town authorities, before it might be disposed of via a competitive bid process or public auction. This process can be lengthy. Similar procedures or other barriers may be involved at the municipal level. For example, in Philadelphia there’s “councilmanic prerogative,” which gives city council members the ability to make land use decisions, including disposition of public land, in their district, while in Detroit, Michigan, the city council must approve purchases over 10 acres. These practices give city council members power of discretion and may put farmers without political influence at a disadvantage. In Boston, Massaschusetts, We Grow Microgreens submitted an application through the City’s RFP process to buy city-owned land in the Hyde Park area to build a greenhouse, a high tunnel, and raised beds. They are awaiting a response, and the long process has delayed the business’ plans to expand. As mentioned, private land ownership by the farmer is less common in an urban context, but there are some examples. Urbavore Farm raises produce and poultry on 13 acres purchased by the farmers within Kansas City, Missouri. Karen Fresh Garden grows in the large backyard of the house the farmer’s family bought in Kansas City, Kansas. Tenancy: As an alternative to purchasing land, urban farmers can rent public or private land. With rented land, success depends on the lease or other use agreement, hinging on what is allowed, rent and other fees, and landlord-tenant relations. Baltimore, Maryland’s Land Leasing Initiative, for instance, provides for 5-year leases on pre-approved city lots. Eligibility is contingent in part on having at least one year of experience and demonstrating that the operation will be “profitable.” The lots, however, are for sale, so the lease can be terminated if the lot is sold. As with most rental situations, it is strongly advised to get a written agreement when possible. Most of the terms in a general farm lease will pertain in urban settings. See Elements of a Good Farm Lease and other resources from Land For Good. A short-term (1-3 years) lease offers flexibility and a trial period, but not a lot of security. Longer-term leases are more secure, but may not be an option with some landowners. Certain clauses may need customized consideration for an urban setting to accommodate the close proximity of neighbors, urban zoning specifics (e.g., prohibited uses), determination of fair rent, site maintenance, water or sewer charges, public access, or soil contamination, for example. Some cities offer licenses or permits, rather than leases, for short-term use of public land. A license or permit is permission to use the property, rather than an actual leasehold interest in the premises. These are less secure for farmers, but may be the only legal or practical option. In a non-urban example, the Massachusetts Department of Agricultural Resources’ State-Owned Farmland Licensing Program makes state land available to farmers under 5-year licenses. These go out to bid, and are renewable. Innovative models: Several innovative arrangements have been developed or hold promise to help urban farmers achieve secure land tenure. This is an emerging field; there are not a lot of examples and each effort is unique. These often involve nonprofit organizations. A nonprofit organization must have a charitable or educational purpose, but that doesn’t mean that it can’t engage in money-making activities such as selling farm products or collecting land rent. For example, a nonprofit group can raise products that the organization sells commercially, along with its educational and training programs, food donations, gardens, and/or other activities. While this model doesn’t provide land tenure for a farmer, farmers could—and do—get experience and income from employment in these settings. A nonprofit organization could acquire urban property for various charitable purposes and rent some or all of its land to one or more commercial farmers. One of the main advantages for the farmer is that the nonprofit is a “friendly” landlord. The farmer might also be involved with the organization’s educational activities or might benefit from the nonprofit’s clientele, marketing, and relationships with the neighborhood or city officials. The Intervale Center in Burlington, Vermont is a nonprofit that leases land to nine small to medium-sized organic farms, both mentor farms and incubator farms, which operate independently and benefit from the shared site. A nonprofit could also act as an interim owner while a plan for the farmer to purchase the land is developed. Lewiston, Maine’s New Roots Cooperative Farm was founded by four graduates of Cultivating Community’s New American Sustainable Agriculture Program with support from the Cooperative Development Institute. Maine Farmland Trust purchased a 30-acre farm property within the city limits of Lewiston on behalf of the New Roots farmers, with a plan to develop an agreement with the farmers that will allow them to purchase the land at a future date and maintain secure access to the property in the meantime through a lease developed with support from Land For Good. As an intermediary, a nonprofit can rent land from a public entity for its nonprofit purposes, and then sub-lease to a commercial farmer. In this way, the nonprofit is a buffer between the landowner and the farmer. It can, for example, negotiate the master lease, create supportive subleases (provided they are consistent with the master lease), and facilitate sharing among multiple site users. The Southside Community Land Trust (SCLT) has a 10-year ground lease from the State of Rhode Island on a 20-acre farm in Cranston. As the intermediary, SCLT subleases plots to several start-up commercial farmers at nominal rates. Cranston is a city, but the parcel is in a more rural setting. One attractive feature of this arrangement is that the farmers share equipment and infrastructure. Another is that they get support from SCLT. Historically, community land trusts (CLTs) have focused on affordable housing, often by acquiring property and offering ground leases to homeowners. In a ground lease, the tenant rents a parcel of land and owns the home and/or other buildings upon it. While there aren’t yet examples of a CLT leasing directly to a commercial farmer in an urban setting, there are examples of CLTs providing access to land for nonprofits with commercial farm enterprises. In Boston, the Dudley Street Neighborhood Initiative’s (DSNI) CLT provides access to both affordable housing and land for food production. It leases land that it owns to The Food Project, a nonprofit with a commercial enterprise, for farm and greenhouse space. DSNI is also developing an additional farm site, mainly for farmer training, in partnership with Trust for Public Land and the Urban Farming Institute. The Madison Area Land Trust (MALT) in Wisconsin is a CLT that also owns residential and agricultural land. In this example, MALT leases land to Community Groundworks, a non-profit that manages a commercial CSA. 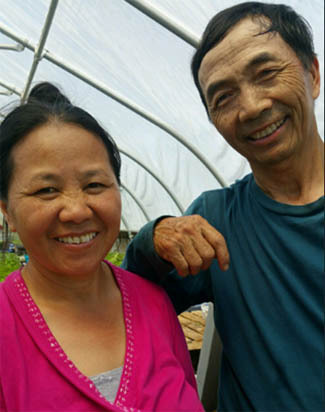 In Olympia, Washington, South of the South Community Farm Land Trust purchased land and tailored their ground lease model for GRuB (Garden-Raised Bounty), a nonprofit with a commercial enterprise. There are also examples of nonprofits that are not CLTs, but have related missions and can play a similar role in protecting land and making it available to farmers. These nonprofits own land in rural areas or less dense areas within city limits, and provide ground leases to the farmland with farmers owning the infrastructure. Grow Food Northampton and North Amherst Community Farm, both in western Massachusetts, created new nonprofits to hold farmland and make it available to commercial farm businesses using long-term ground leases. Equity Trust assisted with these and other agricultural ground lease projects, some involving conservation land trusts. City zoning and other ordinances govern what land uses are allowed and where. Until recently, agriculture was not even contemplated as a land use in most cities, so regulations may be vague or unfriendly to farming. Increasingly, urban agriculture is welcomed by cities, and laws are changing. For the most part, the changes pertain to educational and community gardening endeavors, rather than commercial agriculture. That said, more and more cities are seeking ways to foster urban agriculture, including commercial farms. For example, the Conservation Law Foundation has worked with Portland, Maine, Cambridge, Massachusetts, and Central Falls, Rhode Island on ordinance revisions to support urban farming. City zoning codes might prohibit certain farming activities such as keeping livestock or bees. They might limit the type, size, or location of farm-related buildings, signage, fencing, and compost piles, for example. They might allow commercial agriculture only in certain zones or areas of the city. 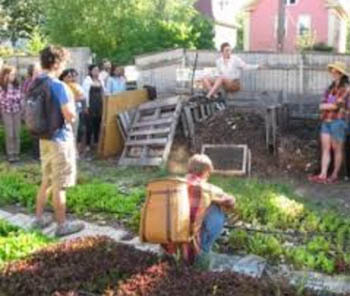 For example, Boston’s Urban Agriculture Code, Article 89, allows all land-based farms up to one acre in any zone (i.e. residential, commercial, industrial) in the city, while land-based farms larger than one acre are allowed by right only in industrial areas and are conditional in all other areas. Special permits or conditions might be required for certain farm-related activities such as product sales. The Somerville, Massachusetts Urban Agriculture Zoning Ordinance requires soil testing (with the results of the soil test clearly posted at the point of sale) for product sales, and only fresh, uncut, and unprocessed produce grown on the premises can be sold. In addition to municipal regulations, state laws related to water, agricultural nutrient management, and other relevant concerns also could impact urban land uses for farming. Removing the rights to develop farmland through a conservation easement or restriction has been an important tool in areas where good farmland is threatened with development. Conservation easements are less likely to be used in urban areas where the parcels tend to be small, and not a high priority for easement programs. Nonetheless, they have been used in some urban agriculture projects. In urban areas, agriculture is often considered an interim use, and even in cases where the “highest and best use” of a parcel is not redevelopment, it may be necessary to find ways to protect the land for long-term agricultural use. To protect the 12.5-acre Fairview Gardens, an innovative agricultural conservation easement was granted to the Land Trust for Santa Barbara County at the time of the purchase that ensures active use as a working organic farm and educational programs under the nonprofit organization, the Center for Urban Agriculture. Fairview Gardens was a farm long before the area developed around it and the City of Goleta, California was established. Another historic farm, Five Fridges Farm, located just outside Denver in the City of Wheat Ridge, Colorado, is privately owned by the farmer. Through a conservation easement held by Colorado Open Lands, the farm is protected for agriculture use forever: it cannot be subdivided or further developed. 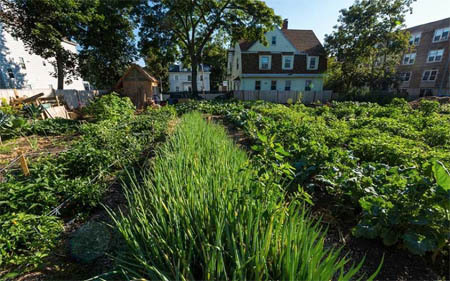 Urban land also may be protected through outright (fee) ownership by a nonprofit land trust such as Neighborhood Gardens Association in Philadelphia (where the focus is on community gardens). Infrastructure: Like their rural peers, urban farmers must consider their needs for water, storage, season extension, fencing, etc. Are these available on a parcel of interest? Can they be installed, and at whose cost? Are there any regulations that would hamper installation or use of infrastructure? What about parking and storage? Some municipalities, such as San Francisco, California and Philadelphia, offer a discounted water use rate for urban farms or waivers for storm water fees. Farms in these cities have received assistance to subsidize or cover the cost of hooking up to the municipal water supply for farm use. Other cities, such as Detroit, provide permits to access water via fire hydrants. Soil quality: Soil quality in urban settings is one of the most critical considerations. It’s important to ensure that the soil is not contaminated on the farm site. Contaminants can include lead from pipes and paint, leaks from underground fuel storage tanks, and other pollutants from previous uses. There may be rubble from old buildings buried on the lot. Depending on the type of contaminant, remediation may or may not be possible. Some urban farmers cap the ground and use raised beds with imported clean soil. Innovative remediation methods include planting sunflowers or growing mushrooms. With that method, the toxic residue must be safely removed from the site. There are many resources that address urban soil quality issues, including the Soil Safety Resource Guide for Urban Food Growers from The Johns Hopkins Center for a Livable Future. Guidelines on testing and remediation can be found at www.urbanaglaw.org/soil or through your Extension service. Housing: In urban settings, farmers are more likely to live off-farm unless they have a backyard farm. Affordable urban housing is addressed by many groups, programs, and policies, but access to affordable housing near the farm may be an issue for urban farmers. Living off-farm (for any farmer) may make emergency tasks, protection from theft and vandalism, and managing animals more challenging. Once urban growers are established, they may face a choice to stay at the same scale, expand within their urban setting or migrate to peri-urban or rural land. Seeking a larger lot within the city may present similar challenges as those experienced the first time around, only more so because larger parcels tend to be even harder to find. Farming on multiple parcels is another option that comes with its own set of logistical and other complications. Farmers who want to move from tenancy to ownership, or onto ground independent of an intermediary organization will need to go through all the requisite research and negotiations. Moving out of the city creates new considerations. Farmers who have been successful on urban plots will likely have to consider changes in their production practices, plant varieties, types of products, markets, equipment, and even residence. It may feel like starting over, with an additional learning curve. And obtaining land—and a new support system—outside of cities presents fresh challenges. Sidewalk Ends Farm, based in Providence, Rhode Island, was founded on a 5,000 square foot lot through a handshake agreement with a private absentee landowner. After the first year, the farmers were unable to reach the landowner to explore protecting the land and increasing their security. They leased additional small, private urban and peri-urban parcels nearby. Farming multiple insecure urban lots proved frustrating to the farmers. After 3 years, they signed a 5-year lease for a small hayfield in nearby Seekonk, Massachusetts. This allows them to more confidently build soil and infrastructure, and grow more food for more markets. Due to discrimination and structural racism, people of color and immigrant farmers may confront additional barriers to land access. Many communities are eager to welcome urban agriculture, but the dynamics can play out very differently based on who seeks to farm there, and who serves as gatekeeper. Racism underpins many interactions in our society, often below levels of awareness. White privilege, language privilege, and familiarity with vocabularies of development or gentrification can open doors for prospective white urban farmers that may remain firmly closed for farmers of color. The ability to communicate and earn trust within a community is crucial in establishing any urban farm; good relationships with neighbors and elected officials can mean more flexibility as a farm tries to get established and build out its vision. As with rural farming, urban agriculture often operates through informal agreements and handshake deals, where land opportunities arise through social networks. Farmers with limited proficiency with English or comprehension of local norms find it more difficult to move through the process of accessing land without outside support from a relevant organization or champion. Thus barriers to land access are higher for people without language facility, the ability to “code-switch” in defense of their projects, or the social connections to make requests of authority figures. Urban farming sometimes can lead to unintended and unconsidered consequences including gentrification. Urban agriculture is more likely to emerge in places with open and undervalued land such as post-industrial cities, poor/disinvested neighborhoods, and environmentally degraded urban landscapes. While properties in these areas might be more accessible, and farms might be an initial asset to the community, they can also be (in some cases unwitting) agents of gentrification. Such transformation can lead to the displacement of residents the farm purports to serve by raising property values, and stimulating competing interests for land. Gentrification may also eventually displace urban farms in favor of “higher use” development options. Adequate land tenure is essential to the success and expansion of urban agriculture. Despite some unique challenges, commercial farming in urban settings can offer multiple benefits to farmers as well as urban communities. Public and private landowners can be important partners in creative and mutually rewarding transactions to make urban land available for farming. The examples in this article provide models to those who seek to farm in urban settings.